This review first appeared in the May 2013 issue of San Diego Troubadour. 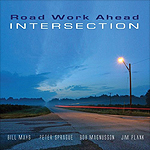 Born during a 1980s recording session for a Bob Magnusson album, Road Work Ahead has toured and recorded intermittently through the years  always picking up right where they left off, whether it was the night before or a decade earlier. Magnusson is the Point Loma-raised bassist who fresh out of school landed a gig with Buddy Rich, then Sarah Vaughan. Guitarist Peter Sprague could live anywhere, but chooses to live in Del Mar except when he’s on tour playing behind Dianne Reeves. Drummer Jim Plank combined with Magnusson as the house band at Elario’s atop the old Summerhouse Inn in La Jolla, playing weeklong engagements with everyone from Eddie “Cleanhead” Vinson to Harry “Sweets” Edison to Kenny Barron. And while pianist Bill Mays no longer calls SoCal home  hasn’t for some three decades  whenever he’s back in the area from his New York base visiting family, he seems to find time to hook up with his above three colleagues to recast Road Work Ahead, whether for a one-night gig or, more fortunately for the rest of us, in the recording studio. Magnusson and Plank’s shared concepts of time and meter create a supple foundation so organic it sounds as if a single person is playing both bass and drums. That solid back end frees up Mays and Sprague to lithely bounce from playing the lead to joining the rhythm section, and then go out front again. Opening the new recording, the band turns the Frank Loesser chestnut “Inchworm” into an uptempo vamp. Jazz standards “You Go to My Head” and “The Very Thought of You” get similarly sophisticated, fun treatments before the quartet turns the Beatles’ “And I Love Her” into a samba, with Sprague giving full rein to his Brazilian influences. The Sprague original, “Wall Street,” is the most muscular song on the album. Mays’ years in New York show in his playing here, which has all the dogged ferocity of someone trying to catch a cab in a Manhattan rainstorm. “Saudade de Voce,” another Sprague composition, finds the band back in a laid-back samba groove, before switching to a vintage West Coast Cool reading of the Rogers & Hart classic “There’s a Small Hotel” that brings Plank out front for a very introspective, atypical drum solo. The Italian jazz standard “Estate” is classic 1960s straight-ahead small combo jazz, while Mays’ lead on the Magnusson original “Wynton’s Motif” (inspired by the late Wynton Kelly) has the same vintage feel but in a more energetic arrangement. The album closes out with Plank’s bright arrangement of the David Rose song, “Our Waltz”  again extending the feeling of a classic 1960s’ jazz summit.